Who knew? When you’re new to something, well, things are new. 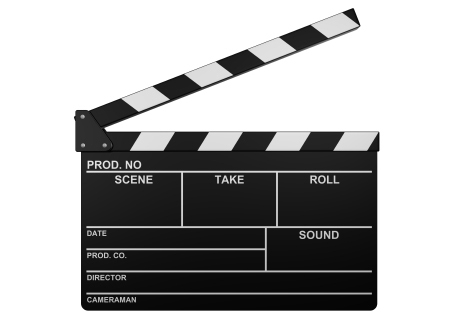 For example, why does the iconic clapperboard clap? It’s not merely to label a new scene — no clap needed for that — but the clap makes it easy to synchronize audio track to visual track; you see one and hear the other at an exact moment. Beautifully low-tech in our high-tech world. As you know, we started making videos last year. First time ever. Besides our short instructional clips, we’ve made three “real” videos, all extracurricular. We’re enjoying it a lot. Here are eight things we’ve learned so far. This is the same thing that drives print. Design is funny. For all of its value, it doesn’t exist on its own. It is the embodiment of something else. The colors and typefaces and layouts you choose have everything to do with the story you’re telling. If you do a good job, its glory or interest or passion will be visible to others. If you don’t, it won’t. Story is everything. An audience settling in to watch a film is a powerful thing, even if it’s a six-minute trailer for church. People give attention to motion pictures that they do not give to anything else. TAKE THAT SERIOUSLY. No field offers as much exciting gear as photography. But all of the cool stuff — the cameras and lights and gels and reflectors and all that — exist, basically, for one reason: to make what’s onscreen look . . . normal. Light should be pleasant, not hot or cold or gray or colored or whatever. Shadows should be shadowy, like your eye sees them, not washed out, not pitch black, not muddy. Sound should be clear. Everything should feel natural, as though you’re not there. Normal is why you can trust your own eye. The world moves. Look around. Even if nothing’s moving, your eyes move, so your view is constantly changing. Five scenes in three seconds? Viewers follow that. In real life, stillness is rare. Don’t linger motionless unless the story requires it, and even then, keep something moving. Thank you, Ken Burns. That said, use downtime. Viewers need space to focus and process. Vary full with empty, busy with still, fast with slow. Storytelling is like Tarzan swinging through the jungle — one vine to another, then another, then another, in sequence. It’s linear. Unlike print or Web, where viewers can read ahead, go back, click around, you alone control the sequence. It’s powerful. Never let the viewer become aware of the camera. Don’t pan. Instead, cut from here to there. If you pan, pan slowly. Zoom sparingly, if at all. Images should look natural, not grainy, not flat, not dim, not blurry. Motion should be smooth, not flickery, not distorted. Sound should be clear and pleasant, at the right volume, not echoey, not muffled, not thin, not boomy. Similar scenes should have similar light, and so on. Staying invisible is what f-stops and exposure controls and rolling-shutter correction are for. You’re filming an interview. Necktie not straight, fingernails not clean, speech not clear, all are distractions. Keep backgrounds simple and desks clear. On film you see small things overlooked in real life. Pay attention. That’s it so far. There are, of course, exceptions to all of this, but these basics will apply, I’m willing to say, 90 percent of the time. Below is the gear we’re using. Keep in mind that in every category are many alternatives that may be more useful for you; everything is better at some things than others. WE ARE NOT EXPERTS. This is the stuff that looked right to us at the time, and we can recommend it. Thank you, Clayton. Canon Vixia HF S10 consumer camcorder with a wide-angle lens adapter and ultraviolet filter . Excellent pictures in good light, weak in low light. Intuitive to use. No longer in production. Replaced by the Canon Vixia HF S20 . Canon XF 100 (right). Brand-new professional model currently unavailable. A price-performance leader. Fifty megabits per second in 4:2:2 color space, unheard-of at this price. It means the camera captures more information and compresses it less. The more info, the more lifelike the footage and the more versatile the camera (low light, fast motion, subtle colors, etc.). Likely delayed by the crises in Japan. 1) Audio Technica ATR-3350 wired lapel (lavalier) mic (right). At $19, this is AMAZING price-performance value for voice. We use this for our instructional vids. 2) Azden WMS-Pro VHF wireless system. VHF (very-high frequency) is sensitive to cell phone interference; UHF (ultra-high frequency) avoids that but costs more. Good price performance for voice. 3) Zoom H4n handheld recorder (right). Palm size. Built-in stereo. Excellent for music, voice, and field recording (crowd noise, railroad sounds, etc.). Near-studio quality. A four-track mixer right in the device. Outstanding price performance. We LOVE this little thing! To get nice, natural light where there isn’t any, or to improve what’s there, we’ve ordered FloLight MicroBeam lights (right). Ours is the three-light kit — three LEDs, each on its own stand, equivalent to 1100 watts of regular light. Daylight 5600K temp, which is the most versatile. 30-degree beam (that’s a spotlight, diffusible for a softer “spread”). Emit no heat, dimmable, and work with colored gels for warmer or cooler light. Can be battery operated if you’re on location. Haven’t arrived yet, but we expect good things. The invisible-camera thing? A tripod is essential. Ours is a Giottos MTL9271B . We got it because it can elevate the camera nearly 6-1/2 feet and remain steady. On top we put a Manfrotto 128RC fluid video head, which is designed to move VERY smoothly. The combo weighs seven pounds — not a ton, but you wouldn’t want to hike with it. So far we really like it. For editing we use iMovie, which does a fantastic job for the little effort it takes, although it’s buggy. Final Cut Pro X, due in June, is a must-have, and we’ll convert to it. Apple’s made it more powerful, more intuitive (more like iMovie), and cheaper, too. And finally, we have two pair of Sennheiser PX 100 II headphones, which are full and rich and light enough to wear all day. Essential for editing. This entry was posted in Editorial, Video. Bookmark the permalink. ← Color logo, black & white fax . . . I need to produce some short training-type videos to be posted on desktop and imbedded in email newsletters. Could I get away with a flip camera, or will its quality be too poor for picture and audio? I know you are just figuring this out, but what is your humble opinion? Do I really need to record audio separate, etc.? Kay, I’d say try one and see. You’ll know if it’s suitable. Trust your eyes and ears. I use the Flip for a lot of short, instructional web videos. Not the quality of Before & After, but a super-inexpensive and easy-to-use alternative for novices wanting to get video online quickly. I have read a couple of reviews that say the iPhone 4 shoots video comparable to (or better than) the Flip. I haven’t used mine for official purposes, but I am very pleased with it for home stuff. Your videos, like all your content, are great. But I wish you would consider close-captioning them for your hearing-impaired visitors. Keep up the good work! Tim, our videos are all close-captioned. Just click the up arrow near the bottom right. This goes to story, but is probably more of a technical issue: tighten up the script. Most people who do “web videos” turn the camera on and start talking. They ramble, they umm and never get right to the point. Most take WAYYYY too long to introduce the topic. Get to the point quickly. What works with a natural conversation with someone hardly ever works in front of a camera. Light and sound. These are make or break, even with a good story. Hate to be a naysayer when I’ve loved Before & After since the first issue, but I can read faster than you can speak. The videos drive me crazy. Plus, my staff assumes I’m watching the latest cute thing on YouTube. Please don’t abandon the printed pages — whether viewed or ink on paper — and by all means keep up the interesting essays at the back of the book. You have often given me material for my students and mentees to think about. I agree entirely — thank you for expressing this so well. Hope they hear it. Your article is spot-on, especially when it comes to having a story to tell. This is what separates videotaping events from a making movies that inspire, instruct, and entertain. I have three of the 512 LEDs from FloLight, and they are amazing. Make sure you get filters from Filmtools. FloLight also has barndoors for them now. I also have the CanonXF300 . . . AMAZING! Also, I use Adobe Premiere, which works better with the .mxf format from Canon, although there is a Final Cut plugin provided. I have the 561B Manfrotto monopod to stay invisible. I suggest the Audio Technica M30 headphones if you can’t afford Sennheiser. Love the addition of video to the feed. In your case, where the camera will be locked down on a tripod, why not go for a DSLR like the Canon T3i or 7D (or 5d mkII — if ya got $$ to burn) and a wireless lavalier mic run through a BeachTek box? Zillions of lens options, HD video, etc. . . .
motor9, yes, DSLR is something we’re looking at. For those who don’t know, a DSLR is basically the standard SLR camera you see hanging around tourists’ necks, souped up to shoot video. Its benefits are extremely high image quality and very shallow depth of field. This allows the foreground subject (like an interviewee) to be in focus, while the near background is out of focus. You see this effect in cinema all the time. It mimics how we actually see. For example, as you’re reading your computer screen right now, the room behind the screen is basically out of focus for you. Depth of field is a beautiful way to put the viewer’s attention exactly where you want it. @Kay: What @Gerald said… The (regular) Flip is OK for the kids to play with; the HD model is much better, but again — great picture, meh sound. I hear the Kodak zi8 is very good for a situation like you’ve described. Always remember to light the subject well, minimize ambient noise (like fans or A/C units) and use an on-camera “shotgun mic” if possible (never or try not to use the in-camera mic, especially for training videos) — or get a good off-camera audio solution like I mentioned above. If possible, use a teleprompter. I am a public speaking coach and writer. I just worked on an online training module for a pharmaceutical company. The video script had to be approved by compliance and legal before we shot a single scene. Although I wrote it, there was no way I could have memorized it! I have a new respect for actors. I’m a Website designer and the trend, here in Australia anyway, is for far more video on Websites (as opposed to static content). I’ll certainly be sharing your post with my clients, as many are craving information on how to improve their video. Thanks for sharing your video learnings so that others may also benefit! Before & After, you are doing a fantastic job of the videos. This equipment is obviously working well. Thanks for the recommendations and all the great information you provide. I use the Flip for a lot of short instructional web videos. Not the quality of Before & After, but a super-inexpensive and easy-to-use alternative for novices wanting to get video online quickly. Your present camera and wish list camera are light enough to be on a boom for over-the-shoulder video when needed. A boom stand would also be great for the digital mic. I have enjoyed your videos immensely, especially with my slow broadband connection. They work perfectly. Other training videos I’ve looked at won’t work on slow broadband. All your videos have been very useful to me and given me confidence in my design work. I feel like I know the important rules. I like the way you tell the viewer the reasons why you do something a certain way. I’m looking forward to more videos from you. You come across as an ordinary person, no arrogance or “I’m the greatest” attitude. Your voice is confident and soothing to listen to. Good work. Lastly, loads of people are using the 7D and its compatriot DSLRs for video work. They put out beautiful footage, but audio sync can be a real problem. The audio tends to drift. It’s a frame rate issue that is only a problem on long-running single clips, but it’s a real pain when you do get it. I’ve had good success with a plug-in called PluralEyes. Just wanted to let you know that your video “Working in a tiny space” has a problem with the audio. I tried watching it on YouTube as well, and the same problem exists. Hope you can get that fixed — I’d like to hear it. :-) By the way, LOVE all your design tips and instruction. “Working in a tiny space” was our first attempt at video, and the audio comes through only one channel. It sounds like you’re plugged into the silent channel. Problem is, I can’t tell you what to do about that. One workaround is to turn on our closed-captioning and read it! You are my favorite design person without a doubt — I love your insight, examples and explanations. The world moves. Look around. Even if nothing’s moving, your eyes move, so your view is constantly changing. Five scenes in three seconds? Viewers follow that. Five scenes in three seconds? I find clips that are too short and too fast are often distracting — you’re left wondering what just happened after the video has moved on and left you in the dust. And shouldn’t it be five shots in three seconds instead of scenes? Regardless, there is a place for quick, quick shots, but they are the exception. Movement is desired but not machine gun movement (unless it is needed for effect). That said, did I miss the point? Five scenes (shots is a better term, thank you) in three seconds can be too many. Five scenes in 60 seconds can be too many — if the scenes are unrelated, disconnected, or complex. What I had in mind is the common technique of shifting point of view in a continuous scene or stretch of action. Say the SWAT team is swarming the house. The scene shifts from the street to the side yard to the kitchen to the bad guy to the roof across the street to the police cars to the porch, all in seconds. One moment you’re the shooter, next you’re a bystander, next you’re the hostage, next you’re on the radio in the squad car, next you’re looking through a window. Viewers have no problem following all that — and can even be unaware that the scene is shifting. Take something simpler: two people talking. As the dialog goes back and forth, you see him, you see her, you see both, you see both across the room, then back to her, to him, and so on. Fast cuts. Three or four cameras. The viewer barely notices the shifts. What I mean by “even if nothing’s moving, your eyes move, so your view is constantly changing,” is this. You’re sitting in your kitchen at midnight. The house is quiet. Nothing moves. Nothing, that is, except your eyes. They move from the sink to the fridge to a cabinet to the floor to a box on the countertop, and so on. If your eyes are cameras, each of these “views” is a cut — flying from one thing to the next to the next. Different shots, really fast. It doesn’t seem like it because they’re all related, connected and simple, but they’re there. So my point, which I didn’t actually get to (sorry), is that once a viewer figures out a scene, he wants to move on. If you linger, he’s bored. He got it, c’mon, let’s go. Viewers can be bored in seconds. Really. My wife can get bored before I’ve said a word. How? She knows what I’m going to say. She’s got it, c’mon, let’s go. People see fast. They get it. Work to that. It’s a pretty good measure for how to pace your story. I find it interesting that you close the column with the words “Stay tuned.” That phrase is a part of our cultural vernacular, but was not even in existence until television became ubiquitous. And yet, it has become almost anachronistic, as it begs us to avoid changing our focus (i.e., the TV channel) and settle for whatever comes next. It almost cautions us to negate the essence of the continually changing movement. To sit, to abide. To relax, breathe quietly and just wait patiently until then next “thing” comes along. Echoing FB’s comment, I’d definitely recommend Premiere Pro over Final Cut Pro if you’ve a 64-bit OS X Mac, especially with the advances in CS5 and even more in CS5.5. You’ll be amazed how butter-smooth the workflow is with the Mercury playback engine and the new Media Encoder. If you upgrade to the new Canon with 4:2:2, this will make a world of difference to your ease and speed of production. Alan, have you had a look at the new Final Cut Pro X?